Favorite Fragrances | Bylands Nurseries Ltd. The garden can be a great place to fill your senses with all the different fragrances of the plants you grow. Some plants have flowers that are fragrant while others spread their fragrance when rubbing the leaves. The one topping my list of fragrant plants is Lavender; I cannot walk by a lavender plant without touching it to take in that lovely scent. Even in winter time when I shovel snow and accidentally hit a Lavender plant, it spreads its fragrance instantly. 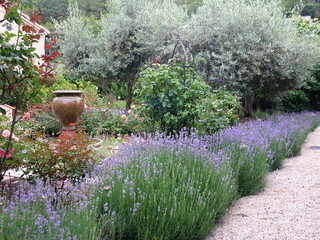 Roses are well known for their fragrant flowers and combine well with Lavender. Modern rose varieties have lost some of their fragrance due to hybridizing. When the focus is on a certain flower colour or disease resistance it is very well possible that during the hybridizing process other traits, like fragrance, get lost. Fortunately there are still lost of fragrant varieties available, like Dwarf Pavement Rose or Therese Bugnet Rose. Another favorite is Garden Phlox. The great thing about Phloxes is that they flower for a long period of time and they are also quite drought tolerant. There are many different flower colours to choose from, so it will not be hard to find one you like. 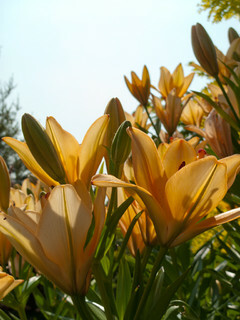 I also like the intense scent of Oriental Lilies. They are great in the border, in containers and also as cut flower spreading their fragrance throughout the home. There are many shrubs with fragrant flowers to complement the fragrance of perennials and roses: Lilacs (Syringa), Mockorange (Philadelphus) and Sweet Box to name a few. Unfortunately Sweet Box (Sarcococca) is not hardy in large parts of Canada (zone 6). It is an early spring bloomer with very fragrant flowers. The good thing is that there is Mockorange, which is hardy in most areas (zone 3), and has very showy, fragrant flowers in early summer. Lilacs are a favorite with many colors to choose from and all very fragrant; a great addition to any garden. If you are looking for a showy and fragrant tree for your garden, Japanese Tree Lilac (Syringa reticulata) is a great choice. In summer large panicles with creamy white and very fragrant flowers cover the tree. Another fragrant tree I really like is Russian Olive (Elaeagnus angustifolia). The yellow flowers are small, but spread a very intense fragrance. I usually smell a Russian Olive before I see it! Herbs are typically very fragrant, especially when touched or crushed. Rosemary, Mint, Basil, Sage, Thyme etc. are all very fragrant and the good thing is: they do not need a lot of space, so can be easily grown in containers to keep them in a spot close to the kitchen to always have fresh herbs close by. Whether you have a lot of space or not, whether you are looking for a perennial, shrub or tree, there are a many varieties to choose from to get lovely flowery scents in your garden! For more ideas ask your local garden center professionals and make sure you follow us on Facebook, Twitter, YouTube and Pinterest for other help tips and hints. I am originally from the Netherlands, where I worked for a municipal parks department and the promotion organization for the Dutch Nursery Stock Industry. My husband and I are still in the process of building our garden as we moved into our house just two years ago and I didn’t like all the plant decisions the previous owners made :) Besides gardening there are a number of renovations going on in our house. Not to forget our dog, three cats and two horses, who keep us more than busy!